Enthuse your space with a hint of Japanese styling and a little extra surface space. The Akita side table adds a little extra surface space to your room. Perfectly proportioned to sit at the side of the sofa for practical uses or dress an empty space in your room with a vase or lamp. There’s added practicality with a discreet drawer hidden in the surface top. Smooth and streamlined with a clear Japanese influence the Akita side table has a sophisticated look which is sure to impress guests. Giving you great surface space with a bit of bonus storage space. 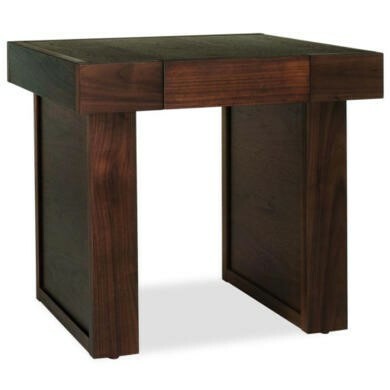 Constructed from strong MDF and finished with a durable and sumptuous walnut veneer. Complete with smooth metal drawer runners. The Akita side table is simple to take care of. Use a duster or dry cloth to maintain a dust free finish. For trickier marks try a damp cloth before resorting to chemical cleaners. Super simple! The Akita side table is delivered fully assembled. There’s no hassle all you need to do is remove the packaging and decide where you’re putting your new piece of furniture.